NYC, 02/20/2019, 4:00PM. Vocal master class. 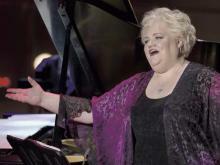 Mezzo-soprano Stephanie Blythe has sung in many of the renowned opera houses in the US and Europe including the Metropolitan Opera, San Francisco Opera, Lyric Opera of Chicago, Seattle Opera, Royal Opera House Covent Garden, and the Opera National de Paris. Her many roles include the title roles in Carmen, Samson et Dalila , Orfeo ed Euridice, La Grande Duchesse, Tancredi, Mignon, and Giulio Cesare; Frugola, Principessa, and Zita in Il Trittico, Fricka in both Das Rheingold and Die Walküre, Waltraute in Götterdämmerung, Azucena in Il Trovatore, Ulrica in Un Ballo in Maschera, Baba the Turk in The Rake’s Progress. She also created the role of Gertrude Stein in Ricky Ian Gordon’s 27 at the Opera Theatre of Saint Louis and sung performances of Ms. Lovett in Sweeney Todd at the San Francisco Opera and Nettie Fowler in Carousel at the Houston Grand Opera and with the New York Philharmonic.